Jupiter may be a giant planet, but compared to Earth it moves like an oxcart in the race around the sun. The Earth’s average speed is about 67,000 miles an hour, while Jupiter lumbers along at less than half that speed, or about 29,000 miles an hour. Because of its faster speed and shorter distance to go around its orbit, our Earth laps Jupiter about once every 13 months. It is a lot like a fast racecar in the inner track passing a slower car in the outer track. The racecar analogy works well to explain a phenomenon called “retrograde motion.” Normally, an observer in the inner, faster race car (Earth) would see the slower, outer race car (Jupiter) appear to move forward (prograde motion). 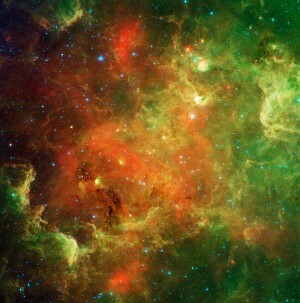 However, as the inner car begins to approach the slower outer car before it passes it, the outer car appears to slow down as viewed against the stellar background. This is purely geometric illusion since the outer car does not actually slow down. Nevertheless, the outer car appears to slow down and just before the inner car passes it, it apparently reverses motion and travels backward against the “fixed” stars. Again, this is purely a geometric illusion. In astronomy, this is called “retrograde motion” and that is what Jupiter appears to start doing tonight (North American time, tomorrow morning in Universal Time). Technically, the moment that the planet appears to change its direction of motion is called the “stationary” point. Right now Jupiter is in the eastern sky in late evening, rising around midnight. It is rather high in your southern sky by daybreak. For the next several months, Jupiter will appear to drift slowly westward among the faint stars of Pisces, the Fishes. Because of their true motions, Jupiter and the other outer planets normally drift slowly eastward against the background of the stars. However, during this time (which ends on November 19), Jupiter appears slightly farther to the west each night. You cannot tell this from night to night with just your eyes, but if you note Jupiter’s position relative to some nearby stars, you should be able to notice it over a period of a few weeks. On the up side, Jupiter is very easy to identify – just face east and look for he brightest object in the sky. On the down side, the King of the Planets is now passing through Pisces, which is one of the faintest of the major constellations. There are no bright stars near Jupiter. This makes it a little difficult to judge its motion. 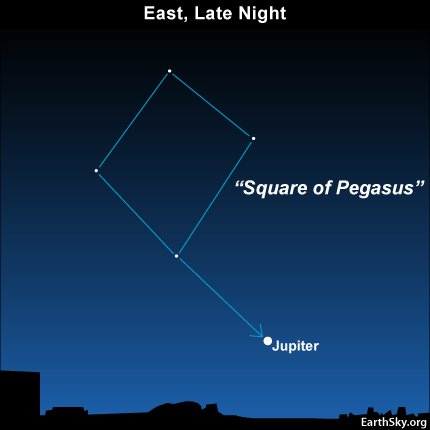 On the other hand, the easily identified Square of Pegasus stays close to Jupiter all year. It provides a convenient landmark (or “skymark”) against which to gauge Jupiter’s apparent motion. If you start tonight (or sometime soon), and plot Jupiter’s apparent position every week or so through November, you should notice a distinct “retrograde loop.” The fact that it is a loop rather than a straight back and forth plot simply reflects the changing orientation of Jupiter’s slightly tilted orbit.